Big Time Gaming invites you to go mining for treasure in this exciting video slot that promises plenty of thrills, and equally as many chances to win big bucks. That’s what Bonanza slot machine is all about. The game features an interesting theme and is definitely unlike any others on the market at the moment. Bonanza can’t really boast its visuals, although it offers a decent enough soundtrack, the most appealing part of this game are its features. This six-reel video slot uses the developer’s Megaways game engine, and as a result of this, it has up to 117,649 winning combinations available. Each reel can contain between 2 and 7 symbols so the number of ways to win changes on each spin, while the winning combinations are formed when the same symbol find its place on adjacent reels. Big Time Gaming really did well with this one and it’s no surprise it climbed to Top 10 list of The Most played slots online in 2018, along with Starburst, Rainbow Riches and some other blockbusters. Multiple opportunities to win. The game offers up to 117,649 winning combinations, which can help players grab substantial wins. Wild symbols. They will appear throughout the game, helping players form additional winning combinations. Reactions: All symbols involved in forming a winning combination will disappear from the grid, making room for new ones, which can lead to more winning combos being formed. Free Spins. The feature initially gives 12 spins, while the possibility of winning extra ones can make the round even more exciting. Terrific graphics. We definitely expected more from Big Time Gaming. High Volatility. Inexperienced players may quickly lose all of their money. Needs more features. That’s for sure. As we’ve already mentioned, Big Time Gaming could have added a feature or two more, but unfortunately, you’ll have to make the most using the Free Spins round, and the Reactions functionality. If a symbol is a part of a winning combination, it will disappear from the grid and be replaced by more icons falling in from above. This can result in new winning combinations being formed, repeating the process until there are no more wins. This feature is activated when you land G, O, L and D Scatter symbols on the reels. Initially, you’ll receive 12 spins, while each additional Scatter will bring you 5 more spins. During the Free Spins round, each successive reaction will increase the win multiplier, which can go up without a limit. Be on a lookout for the mine carts, since they contain a special Scatter that may bring you 5 or 10 extra spins, depending on the number of them landing on the reels. 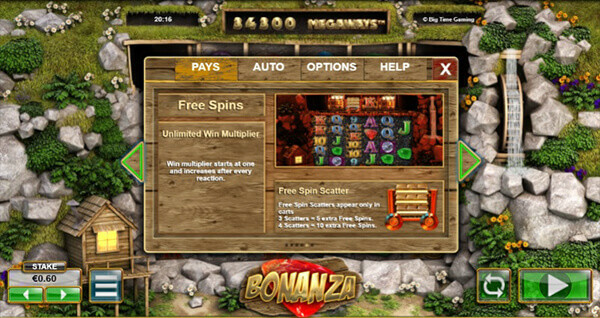 Graphics aside, Bonanza is a dynamic video slot that offers plenty of entertainment. 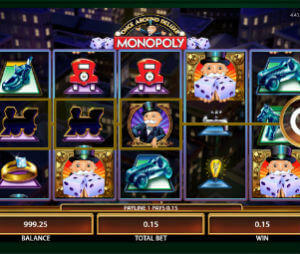 With a bit of luck, you may make the most out of the Free Spins round and grab more than satisfying rewards. However, if you’re a penny punter, you’ll want to avoid this high variance games, because you’ll end up with empty pockets in no time. An average return to player (RTP) is 96.00%, which is lower than the best slot machines which can be found online, but better to common land based slots.